Posted on February 1, 2019 at 8:47 am. It’s official! We haven’t had a single full-day of school even ONCE this entire week. Due to the delayed opening — we will be running on a modified schedule today. Be sure to check with your TA teachers for class and lunch times..And remember — there is NO Wolf Time today, so please proceed directly to your 1st period class following the Morning Announcements. Thanks again, polar vortex!! And now it’s time for WOLF PACK PRIDE! The WMS girls basketball team was UNCONSCIOUS yesterday — scoring a double-digit win on the road against Kenmore Middle School. The offense was ON FIRE — with 12 different players getting baskets. Scoring was paced by 8th graders Brooke S., Grace M., Maddie S. and 6th grader Helene L. 7th grader Olivia N. led the team in rebounds, and 8th grader Grace M. had 5 big steals. Way to go, baller wolves!! [clap]. Next up, WMS takes on Jefferson on TUESDAY at home. Let’s make it FOUR in a row!! Wolf Pack Pride continues with the WMS Wrestling team. Our athletes put up a good fight, and put on a great show, but ultimately dropped their first wrestling match of the year — 36 to 51. Highlights include big victories from Cambyses, Michael, Gian, Aidan, Will and Cale. Way to go, wrestling wolves — you’ll get them next time!! [clap]. The next match is scheduled for next THURSDAY at home against Gunston. Up next, it’s time for the monthly Wolves with Character award! Just take a look at the screen to see all the deserving honorees from the 6th, 7th, and 8th grades — all of whom were chosen by their teachers for demonstrating outstanding CARING in their daily lives. 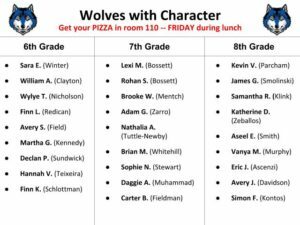 Congratulations, wolves with character! [clap] Be sure to stop by room 110 during your grade-level lunch TODAY and pick up your free pizza! Listen up 7th grade Journalism students from the 1st semester! The “Pizza & Screening Party” is ON — and we’ve also got DONUTS! There’s plenty for everyone, so even if you haven’t RSVP’d yet, be sure to come to the Library Classroom TODAY during 7th grade lunch. See Mr. Schonfeld with any questions. And now for an important announcement for all students who are competing in the Virginia Junior Academy of Science. The VJAS meeting has now been RESCHEDULED for next MONDAY in room WW 22 during Wolf Time. If you are not able to make it, please be sure to see Mrs. Warden as soon as possible. Once again, the VJAS meeting will now be on THURSDAY morning in room WW 22. This is a reminder to all Math Counts participants that the 36th annual Math Counts Competition is this SATURDAY at 11:30 a.m. at George Mason University. You’ll be taking on some of the best mathematicians from nearly 60 area schools. See Mr. Mencarini for more information, or with any questions. We’re “counting” on you, math wolves!! Do you like to ride bikes? Interested in learning bike maintenance skills? Then the WMS Bike Club is for you! A representative from Phoenix Bikes will be visiting WMS next TUESDAY during all grade-level lunches — to take questions and recruit new members. Club meetings begin the following TUESDAY, February 12th, during ASP 1 and 2 in room 124. See Ms. Scruggs with any questions. Let’s ride!! Attention 6th and 7th graders! Believe it or not, but it’s already time to sign-up for next year’s classes! Whether you’re staying at WMS or going to the new Dorothy Hamm Middle School next year, your Course Request Form — the CRF — must be turned-in to your counselor by next FRIDAY at the latest. If you miss the deadline, you could get stuck with a class that you don’t really want. So stop procrastinating and complete your CRF! See you grade-level counselor with any questions. Breaking News!! Mr. Schonfeld is looking for a new crop of student-reporters to take over WOLF-TV next year. Interested 6th and 7th graders are encouraged to sign up for New Media Journalism or Broadcast Journalism on your CRF — and YOU could be the star of the show. The TRUTH is out there — so sign up TODAY! See Mr. Schonfeld with any questions.